2GB GDDR5 2DVI/HDMI/DisplayPort PCI-Express Video Card ZT-60901-10M. PCI Exress 16 version 3. Uses the NVidia GeForce chip set. 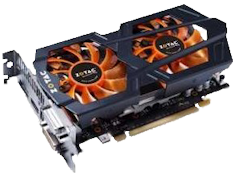 Zotac is a German company that makes PCs, motherboards and videocards. Can connect to HDTV. Dual silent fans. The name puts me off. I think of Adam Sandler and his character, Zohan Dvir. Zotac sounds like the name of the arch villain in a video game or a stomach remedy. It has a 192-bit path to memory. 960 shaders, 80 texturing units, 24 rasterising units. 140 watts (lower power than the competition). Max resolution 3840 × 2160. There are 3 sub models, with slightly different clock frequencies. The 903 (980 Mhz) is slowest, then the 901 (993 MHz), then the fastest, the 902 (1046 Mhz). Specs.